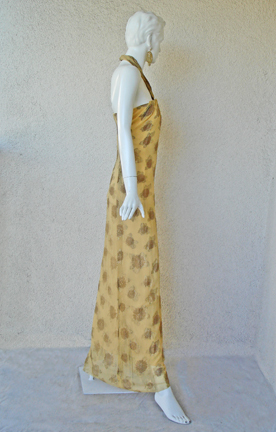 A rare circa mid-1960's evening gown by Spanish designer, Manuel Pertegaz. 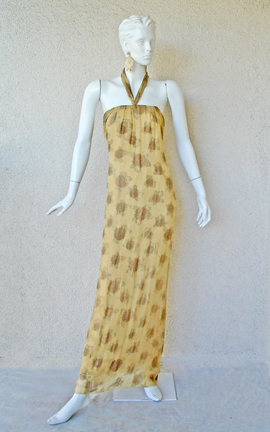 Backless halter gold silk charmeuse overlaid in gold silk chiffon with floral pattern woven in gold threads; slightly reminiscent of sari fabric. Bodice is boned. 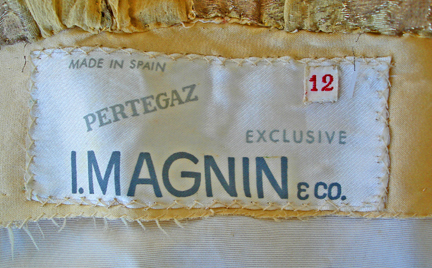 Designed by Pertagaz exclusively for I. Magnin. Condition: excellent. 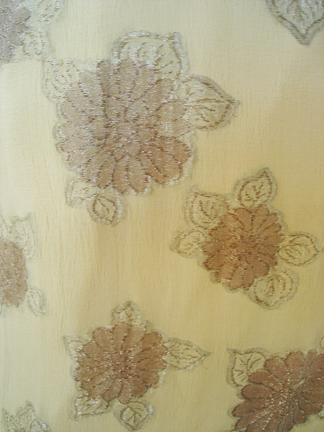 Note: woven gold floral pattern is lighter than the pics show. Manuel Pertegaz presented his first Haute Couture collection in Barcelona in 1942. Soon after, he opened a shop in Madrid and embarked on a phase of expansion overseas, presenting his collections in Paris and various other cities in the United States. His achievements outside of Spain were so remarkable that at one point he was being considered as Christian Dior's successor, heading the fashion house. Throughout his career, he has received numerous accolades, including the "Oscar for Couture" from Harvard University in 1954. 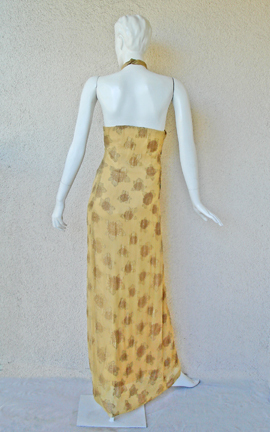 Manuel Pertegaz also designed for Jackie Kennedy and Ava Gardner.